This module is useful for combining image recording with data received from NMEA compatible GPS devices. The module allows the user to choose which information will be decoded from the NMEA string received from the GPS device. Latitude, longitude, altitude, speed, bearing and time can be decoded. Depending on the GPS device, not all information may be transmitted. The GPS data can be "burnt" on each image or simply be overlaid (no damage to the image data). The user can specify the font type, size, position and location on the image. 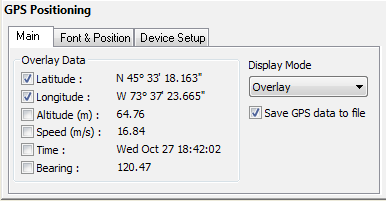 Also, when recording, the GPS data corresponding to each saved image can be stored in a comma separated text file. The GPS device can be connected via a USB or a COM port. For the COM port connection, the user can specify the COM port, baud rate and GPS device format (NMEA or GARMIN). StreamPix has the option to save the GPS information as metadata, along with the sequence file. The metadata recording can be enabled from StreamPix settings->Metadata page->Save metadata option. There is also a module called Metadata Display, that can be loaded to see the current metadata. The GPS metadata can be overlaid on the image in live mode, when recording or even burnt on export. This is detailed in the StreamPix user manual, under the Metadata Overlay module. If loop recording with metadata is needed, there is one more thing that has to be done: set the metadata constant size to a certain value, not zero. This is detailed in the StreamPix user manual, under the Metadata Spy module. Further more, when exporting to JPEG, using a sequence file that was recorded with GPS metadata, the GPS info can be burnt into the image EXIF properties.